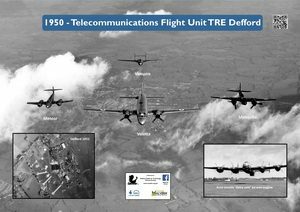 The function of the Telecommunications Flying Unit (TFU) was to provide flight trials support to the Telecommunications Research Establishment (TRE). It arrived at RAF Station Defford, from its previous base at RAF Station Hurn (now Bournemouth Airport), in the last few days of May 1942, at the same time as TRE was arriving at Malvern College from Worth Matravers in Dorset. When TFU arrived it brought more than 50 aircraft of many different types, scores of RAF aircrew to fly them, and hundreds of RAF personnel to maintain and service every aspect of the aircraft. It also brought with it the normal administrative control structure of a RAF operational airfield with a Group Captain as Commanding Officer. Although the aircraft wore the same markings as RAF aircraft, they were actually under the control of the Ministry of Aircraft Production (MAP), the Government Ministry which controlled TRE and some other military research establishments. The MAP loaned the aircraft to TFU (they became ‘on charge’ of TFU) who operated them for TRE. 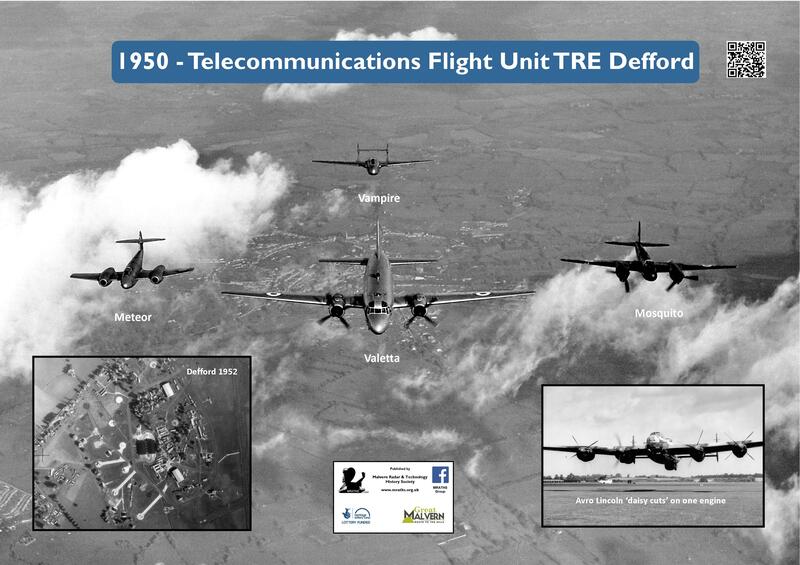 Most of the TFU aircraft were there for the flight testing of equipment designed at TRE and required modifications to install the ‘black boxes’ designed by the TRE ‘boffins’ (scientists) who would also flight test the equipment; the modifications were designed, manufactured and installed into the aircraft by civilian TRE staff, based at Defford, and working alongside the RAF aircraft maintenance personnel. By the end of the Second World War, there were about 140 aircraft and 2500 RAF and WRAF personnel at the airfield. A much smaller RNTFU, manned by Fleet Air Arm personnel, looked after Royal Navy aircraft based at Defford for flight trial duties. The number of aircraft rapidly reduced following the War’s end, but then started slowly to increase again following the coming of the Cold War in 1947. In 1946, control of TRE was passed to the Ministry of Supply (MOS), and a major change came to Defford in 1948 when civilians were recruited to service and maintain the aircraft. The MOS also took over MAP’s huge fleet of experimental and trials aircraft on loan at many locations throughout the country; a top-level MOS officer, the Controller Supplies (Air) – later Controller (Air) – had control of the aircraft which came to be known as the CS(A) Fleet. With the withdrawal of the RAF servicing personnel, the airfield was ‘rebranded’ “MOS Air Station Defford”, and the Fleet aircraft were placed on charge of TRE itself. In the administrative structure of TRE, Defford became TRE’s “Aircraft Department”. Throughout all these changes, RAF aircrew had remained to fly the aircraft. However, by this time, in actuality the TFU had reduced solely to comprising the aircrew; a Group Captain remained as their Commanding Officer. In September 1953, TRE merged with the Radar Research and Development Establishment (RRDE) at Leigh Sinton, Malvern, to form the Radar Research Establishment. This change caught up with TFU in Oct 1955, when it became the Radar Research Flying Unit (RRFU) which title remained unchanged when RRE became Royal Radar Establishment in April 1957. Defford airfield closed in September 1957 and RRE’s Aircraft Department moved to its final home at the former RAF Pershore airfield which had closed in 1953. It was enlarged, modernised, and extensively modified to suit it to RRE’s requirements. In September 1957, forty aircraft moved to RRE Pershore. Defence research spending economies in 1972 dictated the need to run down and close RRE Pershore. Nineteen aircraft were flown to the Royal Aircraft Establishment airfield at Bedford (an outstation of RAE Farnborough) from where they continued to fly for the Malvern establishment. Pershore closed as an airfield in June 1977, and RRFU became the Radar Research Squadron of RAE Bedford. Postings to TFU/RRFU were always popular with the aircrew of postwar years. Their number was relatively small so the Unit tended to have a personal feeling, and its location was both well-situated and in a beautiful part of the country. A popular feature amongst the Unit’s pilots was that it was always ‘well-supplied’ with aircraft of several different types – some of them very rare, or even unique. The boffins often required very accurate flying for their task so the pilots’ and navigators’ skills were well-exercised and, once the task was completed, the aircrew were often given some freedom to ‘do their thing’ during the remainder of the flight.